Have you ever felt really great after spending a day outside? We mean really, really great, like everything in your body and the world is how it should be. There are scientific reasons why you feel this way after being in nature, and one is the concept of grounding, also known as earthing. We touched on this in our blog post about creating the healing effects of the beach at home, but let's dig deeper into what grounding is, how it's beneficial, and how you can practice it. 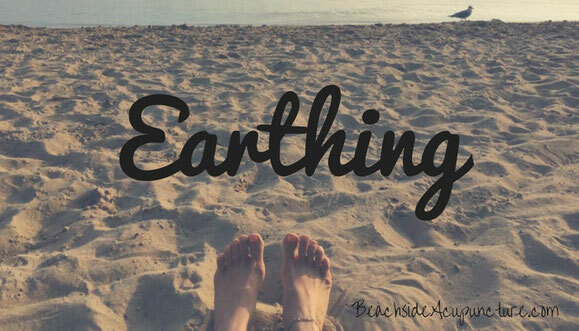 Earthing is simply purposefully coming into contact with the earth's surface for a period of time. This may sound ridiculous at first glance - aren't we all constantly walking on the earth at all times? Technically, yes, we're all on the earth, but few of us truly come into contact with our planet regularly. Think about what you do before you go outside. First of all, you probably put on shoes, almost all of which contain rubber that block the soles of your feet from touching the ground. Second, you probably don't spend much time on bare earth but rather walk on carpet, flooring, paved roads, etc. In order to practice grounding, your bare feet need to be touching bare earth. Think back to middle school science class: What is lightning? If you remember your teacher explaining that lightning is nothing more than static electricity - the same as the little spark you see when you touch a door knob after walking across carpet - then the concept of a negative ion should be nothing new to you. 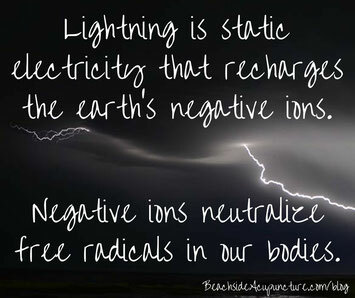 In nature, the atmosphere is full of positive ions and the earth has negative ions, and lightning is the static electricity that perpetuates this balance. By coming into direct contact with the earth, our bodies absorb these negative ions, which can stabilize the free radicals in our bodies that cause damage to our cells in their quest for electrons. Free radicals are created naturally through cellular processes but can increase with poor lifestyle choices or even with intense exercise. Antioxidants in foods and supplements serve to neutralize these free radicals - which are nothing more than molecules looking for an extra electron - but earthing can do the same thing! Through grounding you absorb negative electrons that pacify these free radicals, leading to a decrease in cell and tissue damage and therefore decreasing inflammation in the body overall. Our ancestors constantly practiced grounding without thinking about it, sleeping on the ground and walking barefoot or in thin, conductive shoes like leather moccasins. Nowadays, however, earthing usually needs to be intentional. As the weather warms up and winter turns to spring, make a point of spending time outside with your bare feet touching the earth, even if the rest of you is still bundled up! You can walk in grass, garden barefoot, sit under a tree and read, or practice meditation or yoga outdoors. Aim for at least 20 minutes (more if you can) each day and we recommend finding a sunny spot to soak up some beneficial Vitamin D as well. Of course, use common sense: Make sure you're not stepping in ant hills or over glass, and limit your time in the sun if you know you tend to burn. If you absolutely cannot get outside for some reason, companies have developed earthing mats that bring the electrons from the earth indoors. While these can be beneficial additions, we personally would rather have you spend time outdoors when possible! While grounding is not a pillar of Traditional Chinese Medicine per se - as we mentioned, thousands of years ago people didn't need to think about earthing because it was a way of life - TCM advocates harmony with nature and the return to a natural lifestyle. Add this practice to your daily health routine and reap the benefits that nature yearns to provide for you.